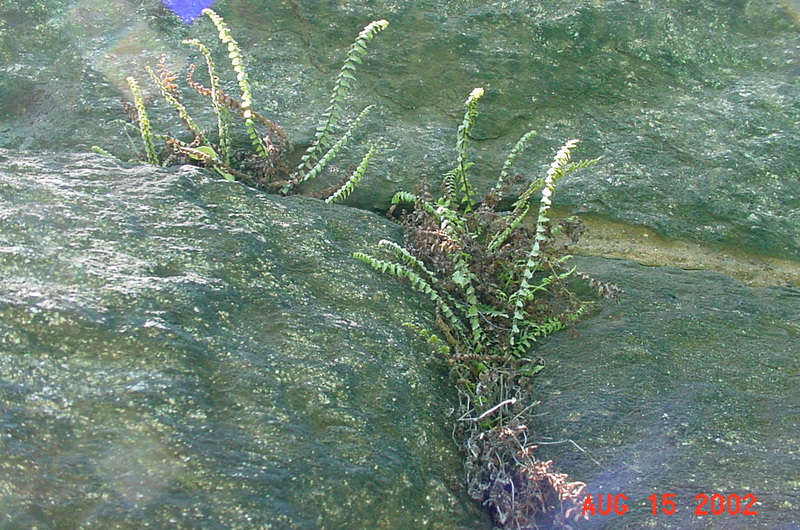 Asplenium platyneuron is a fern from a short, unbranched rhizome 0.3-0.4 cm thick, but covered by old leaf stalk bases. Asplenium platyneuron. By Arthur Haines. Copyright © 2017. New England Wild Flower Society. gobotany.newenglandwild.org (Accessed 10/2017). Leaves evergreen, tufted at end of rhizome; 5-50 cm long, stalk wiry, dark brown, smooth, 1/4-1/3 the length of the blade, scaly at base; blade 4-50 cm long, 2-7 cm wide, once pinnate, tapered at both ends, midrib (rachis) dark brown, wiry, shiny, leaflets alternate, 15-22 per side, almost stalkless, to 1 cm long, 0.4 cm wide, tip rounded, base with small, ear-like lobe on the lower side that overlaps the rachis, margin slightly toothed, leaflets becoming much smaller near base of blade; fertile leaves few, longer than sterile leaves, linear-oblong, with 30-50 leaflets per side, blades 1-3.5 cm long, 0.3-0.6 cm wide (Flora of North America 1993+). 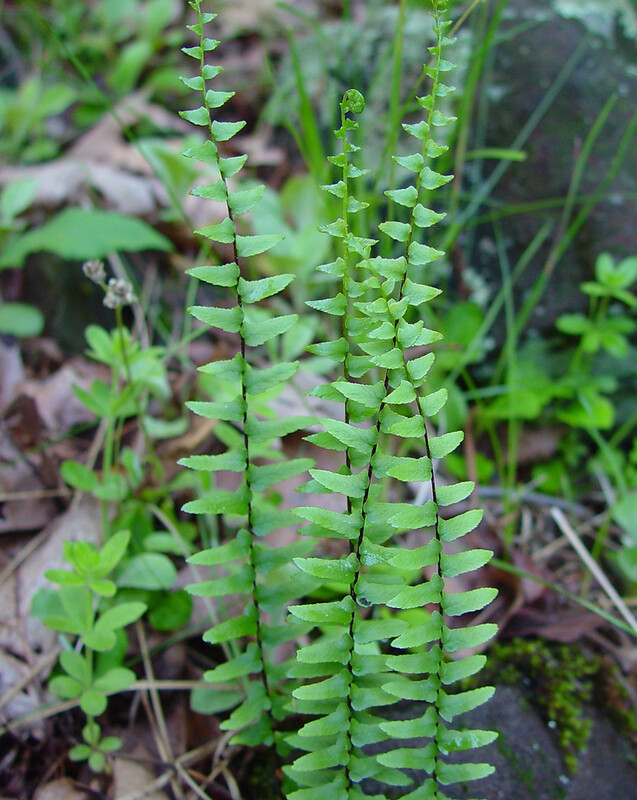 Asplenium platyneuron.Patrick J. Alexander, hosted by the USDA-NRCS PLANTS Database (Accessed 5/2015). 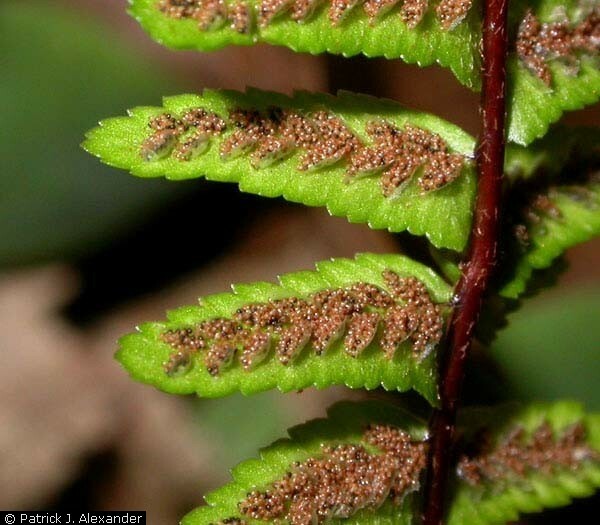 Spore cases: oblong, brown, in fish-bone pattern, each pointing outward from along leaflet midrib. Habitat: Woodland understory, circumneutral soils, often in disturbed woodlands and from cracks in stone walls and masonry. Notes: Locally common on the stone part of the Metro North RR trestle.